HAWK Center is: Helping Arkansas Wild "Kritters": Ka-Thunk! That's the noise the tiny little bird made when it flew into the reflection of the sky. The window was not forgiving and the little bird went down quickly. Fortunately for this little bird, the homeowner called HAWK Center. I just happened to be in town so told the caller I'd be by within thirty minutes. When I arrived, she had the tiny finch sized bird sequestered in a cardboard box, out of reach of the prying eyes and hands of her toddler. She didn't know if it would still be alive as we slowly peeked into the box. No sooner than a crack was open, the little bird came flying out and flitted around her kitchen. Toddler #1 looked like a cat on the prowl and was eager to help catch the bird. Although the easiest solution would be to open the door and let it go, I hadn't yet done a physical on the bird and was yet unsure of its' readiness to go free. 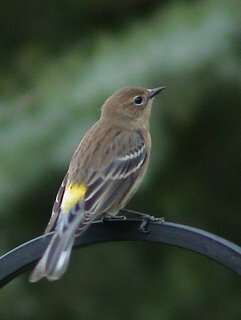 So, in a flash I grabbed the tiny bird and quickly identified it as a Yellow Rumped Warbler. Seeing no signs of central nervous system damage, and no obvious broken bones, I took it home for one night of observation. All looked great by morning so I packed the little one back in his box and took him back to the place he was found. Opening the box, he flew out faster than he did in the lady's kitchen yesterday! He promptly went up into some birch trees, where I was able to watch him flutter around after bugs. That's what it's all about!